The banks' constant refrain during this mortgage mess is that the paperwork issues are mere technicalities -- nothing to be concerned about. The documents are all true, they assert, we just didn't honor the proper procedures. But it doesn't take much digging into the issue to find a case like that of Tandala Mims of New York, which calls into question the whole foreclosure process and the systems that support it. 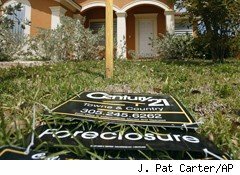 In Mims's case, which will be argued again on Thursday, her lawyer, consumer bankruptcy attorney Linda Tirelli, argues that Wells Fargo (WFC) should not be able to foreclose during Mims's bankruptcy because the bank's documents claiming ownership of the mortgage appear to be false in several ways. To foreclose, Wells Fargo will have to prove to the bankruptcy judge that it has the legal right to -- that it has "standing" -- because either it owns the loan or it's representing the entity that does. Wells tried to prove standing once, but the judge wasn't convinced, ruling against Wells on Oct. 27. At that point, Wells had produced a note and an assignment of mortgage, both of which were deeply flawed documents. The first note Wells introduced showed that Mims originally owed her mortgage debt to a company called Lend America, which then transferred the note to Washington Mutual. Let's remember: JPMorgan Chase (JPM), not Wells Fargo, bought Washington Mutual. Nothing in Wells's documents showed how it ended up with the note -- nor was there any indication that the note had been transferred to JPMorgan. Similarly problematic was the paper purporting to assign the mortgage to Wells. That document says Lend America assigned the mortgage to Wells Fargo, which on its face is odd. If the note belonged to Washington Mutual as it indicated, the mortgage should have been WaMu's to assign. After all, the general rule is the "mortgage follows the note." Worse, Lend America appears to be out of business, as Tirelli's motion details. So even if it somehow retained the mortgage after transferring the note, it's hard to understand how Lend America is assigning anything these days. Not to worry, Wells Fargo may say: The assignment occurred through the magic of MERS -- Mortgage Electronic Registration Systems, the tracking database firm named on some 60% of mortgages today. Specifically, MERS was named on the original mortgage as Lend America's nominee, and John Kennerty, a Wells Fargo employee and known robo-signer, used his additional authority as a MERS "certifying officer" to assign the mortgage to Wells. An obvious conflict of interest exists when Wells Fargo is essentially assigning a mortgage to itself to prove its right to foreclose. But the fact that Kennerty signed as nominee for Lend America also suggests that the MERS database didn't keep up with what happened to Mims's mortgage and note because again, Kennerty -- or better yet, a MERS "officer" who doesn't work for Wells Fargo -- should be signing as a nominee for JPMorgan Chase. In any case, Wells Fargo failed to convince the judge it had the right to foreclose, so it submitted another round of documents to prove standing. The second time around, Wells filed a note that showed Washington Mutual endorsing it "in blank." The blank endorsement, if real, would give whoever is holding the "new" note rights in it. This endorsement, however, is problematic. When did it appear on the note? After all, Wells certified that the note without the in-blank endorsement that it first submitted was a "true and accurate cop[y] of the original document" as of Sept. 16, 2010. If the endorsement was added after that point, Wells should have asked the court's permission before adding it. But if the endorsement is to be believed, it has to be several years old. As Tirelli points out, the WaMu entity supposedly endorsing the note ceased to exist years ago, and WaMu in any form went out of business a few years later. If the "new" note is a real copy of the original -- meaning the endorsement was done when that old version of WaMu existed -- then that version has been in existence for years, and the "old" note Wells first submitted must be quite old indeed. So why did Wells think the first version was a true and accurate copy of the original? What research does Wells do before certifying the documents it submits to court? I'd like to hear how Wells explains those differences. As to the assignment, Wells made no substantive changes but submitted documents claiming to support what Kennerty did on behalf of MERS. Tirelli points out that if the loan is researched on the MERS site, Wells is identified as the loan's servicer, and some unnamed "investor" that chose not to reveal itself in the database as the owner. While that suggests some mystery investor has the right to foreclose, it equally suggests that Wells doesn't -- at least not in its own name. I wonder if the investor knows that Wells is trying to do just that? I can't wait to see what the judge makes of this situation.